St George – the main post! What do we know about him, and how do we know it? Study: Christopher Walter, The Warrior Saints in Byzantine Art and Tradition, Ashgate, 2003. Google Books Preview here. Essential reading. St George himself, whoever he was, even he even existed, has left no mark in the historical record. There is not the slightest mention of such a figure prior to the late 5th century. He was removed from the Roman calendar of saints in 1969. In the late 5th century, archaeology gives us churches, dedicated to Saint George. Literary sources of the same time likewise mention the veneration of St George. In 530 we have a mention of his shrine at Lydda ( = Lod, = Diospolis) in Palestine by the pilgrim Theodosius. Also in the early 6th century we have a Saint’s Life from which all subsequent Lives of the saint derive. This Life is so silly and so full of absurdities, that it is clearly a piece of fiction, based on nothing but imagination. It is so bad that we also have an official Catholic condemnation of it, again from the early 6th century, in the Decretum Gelasianum. The narrative in brief is of a Roman soldier, born in Cappadocia, who becomes a Christian, is put on trial by the emperor Datianus (sic) in Egypt, executed three times(! ), and buried at Lydda in Palestine. During the Dark Ages folk-stories arise of miracles wrought by the saint after his death, in response to prayer. These continue to come into being until modern times. The notion of St George the “invincible warrior” appears. During the crusader period, a version of St George, the Red Cross Knight, is adopted as patron saint of England. Around the same time, some ingenious person composes the legend of St George and the Dragon, based on the ancient legend of Perseus and Andromeda. This body of material appears in the Golden Legend of the west in the late medieval period. In short, we are dealing with fictional material about a figure for whom we have no evidence whatever, and no factual material whatever. Hagiography as a genre runs across a spectrum, all the way from historical accounts, down through fictionalised or “improved” versions of the facts, until we end up with wholly imaginary saints and wholly fictional Lives. St George is at the far end of that spectrum. 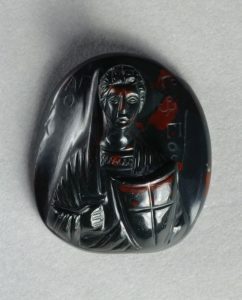 Bloodstone Cameo with Saint George, 1000-1100, Byzantine, The Cleveland Museum of Art. Database: Paweł Nowakowski, Cult of Saints in Late Antiquity Database,. St George is S00259 – http://csla.history.ox.ac.uk/record.php?recid=S00259. Contains details of all the early archaeological and literary material, with very learned commentary. These appear in the 6th century, although some inscriptions might be tentatively dated to the end of the 5th century. It is frequently said that there is a 4th century inscription at Shaqqa in Syria dedicating a church to St George. The inscription exists, but the dating era is that of the Era of Maximian, and the correct date is 549 AD. I have written about this here. The earliest dated inscription to mention St George in fact seems to be at Izra / Ezra / Zorava, also in Syria, again dedicating a church to the saint. The date is 515 AD. I’ve written about this item here. Greek text: J.B.Aufhauser, Miracula S. Georgii, Teubner, 1913. Available online here. French translation: A.J. Festugière, Sainte Thècle, saints Côme et Damien, saints Cyr et Jean (extraits), saint Georges. Traduits et annotés, Paris: Picard, 1971. All the material from Aufhauser is translated. English translation: Miracle 6: Daniel J. Sahas, “What an Infidel Saw that a Faithful Did Not: Gregory Dekapolites (d. 842) and Islam”, in: Greek Orthodox Theological Review 31 (1986), 47-67. Based on the text at PG 100, cols. 1201-12. Online here. – Other online St George material by David Woods is here – a nice bibliography here, inscriptions here. Study: J.B. Aufhauser, Das Drachenwunder des heiligen George in der griechischen und lateinischen Überlieferung, 1911. Online here. – Piotr Grotowski, “The Legend of St. George Saving A Youth from Captivity and Its Depiction in Art”, Byzantine Studies, 2001. Online here. The items are given in order of how early they appear in manuscripts. The collection itself is modern. More than one version is often printed. There is no canonical form for any of these narratives; they are folk-stories, retold as often as they were told, in different words. For this reason Aufhauser’s summaries of the contents are as good as a translation to most of us. Greek text: K. Kumbacher, Der heilige Georg in der griechischen Überlieferung, . Available online here. Other texts: Acta Sanctorum, April vol. 3. In the Paris reprint this starts on p.101, here. Studies: Hippolyte Delehaye, Les légendes grecques des saints militaires, Paris: Librairie Alphonse Picard, (1909) 45-76. Online here. – John E. Matzke, “Contributions to the History of the Legend of Saint George, with Special Reference to the Sources of the French, German and Anglo-Saxon Metrical Versions”, Publications of the Modern Language Association of America, (list of volumes online here), in vol. 17 (1903) and vol. 18 (1904). Essential reading. I discuss it here. For most “saints lives”, the original story is more historical, and later versions acquire miraculous additions. But for St George it is the other way around; the original story was so ridiculous that it was condemned in 492 in the Decretum Gelasianum, and all later versions show omission. It tells the story of George of Cappadocia, arrested and tried in Egypt by the emperor Dadianus (?? ), executed three times, including being torn to pieces, and resurrected each time. The author of the life is a certain Passicrates. The “apocryphal” version is not attested earlier than the late 5th century. Our knowledge of it consists of a 5-6th century palimpsest (Pal. ), two more or less complete Latin translations (Gallicanus and Sangallensis), and four Greek manuscripts in various states discovered by Krumbacher. This version was the basis for all the oriental translations, including Syriac, Coptic, and many others. The “normal text” appears later, although how much later is unclear. Dadianus becomes Diocletian, and the account is tidied up. This in turn is the basis for most subsequent Greek versions, including the Symeon Metaphrastes edition of saints’ legends in the 11th century. Latin texts are based on a mixture of the apocryphal and normal text. There is much more detail on all this in my post on the texts of the Martyrdom of St George here. The martyrdom of St George, Solider and Megalo-Martyr, is commemorated on April 23. I’ve been writing about St George for a while, now, as it has been hard to get access to solid information. My initial post is here. My post discussing St George and English nationalism is here. The standard late-medieval English life – the Golden Legend – is here. How the word “legend” changed from “Something that must be read” to “something probably not true” is discussed by Sherry L. Reames, The Legenda Aurea: A Reexamination of Its Paradoxical History, 1985, p.27 f.
As mentioned earlier, a Life of St George appears in the list of apocryphal works in the Decretum Gelasianum, (online here), a 5th century list of books approved and otherwise – as a composition likely to bring discredit on the church, and probably written by heretics! No doubt the use of “Athanasius” for the name of the magician who opposes George in Egypt has something to do with this, as does the name of George of Cappadocia, the Arian bishop of Alexandria. Finally, St George was still venerated quite late in England. I came across a 1633 English account of St George which can be found online: Henry Seyle, The Historie of that Most Famous Saint and Souldier… St. George… the Institution of the Most Noble Order of S. George, Named the Garter, 1633. Online here. There are quite a few holes in all this, and most accounts of St George contain errors. The relationship of all the Latin stuff to the Greek texts is simply not defined. Somebody needs to go through all this and draw up a spreadsheet of texts, recensions, and references. The task requires more time and energy than anything else, and the output would certainly be publishable. Anybody interested? Historians can be ultra skeptical sometimes! As poor, insignificance and (probably) illiterate soldier I wouldnt expect there to be a literary record of St. George unless an educated person was present to write up a ‘life’ or a homily. We actually have very little hagiography or homilitic literature from Palestine outside Eusebius. I have heard that one of the unnamed martyrs in Eusebius’ ‘Martyrs of Palestine’ might be George. Anyway, a gap of 100/150 years before literary evidence shows up is not a big issue. Take some of the martyrs from Herbert Musurillo’s ‘Acts of the Christian Martyrs’. He has 28 ‘authentic’ accounts from the pre-Nicene period. Someone like Conon (number 13) or Dasius (number 21) don’t appear in other evidence like synaxaria or martyrologies for hundreds of years later. If the account had been lost or never written historians might very well be writing about the mythical marytr Conon! Also, some of the martyrs mentioned in homilies by John Chrysotom like Bernike, Prosdoke, Domnina, and Drosis outside his homilies. PS: the veneration of St. George is alive and well in the Orthodox Church! Excellent! Just one minor point: the dragon legend is probably older than the crusades and the Latin legenda aurea. A Georgian version is found in an 11th century ms., and Cappadocian pictures of St George and the dragon as early as the 7th. This according to the cited book by Walter, the Warrior saints (pp. 125, 128, 140-41). Many thanks for this lucid, link-full, overview! One thing it leaves me wanting to know more about (not yet having attempted to tackle Aufhauser’s Das Drachenwunder) is the literary and archaeological evidence for Perseus and Andromeda. Just wanted to say that Saint George wasn’t removed from the calendar but his importance was changed to “Memorial”.